Your style or profile of negotiation can define whether you grind into a deadlock, or create value and with it an enduring relationship. So what do you do when your needs are incompatible and your path to agreement starts to fade? People often ask “which is the best negotiation style?” As with much management theory there is no single ‘best’ or ‘right’ approach. All five profiles of dealing with stressful and high pressure negotiations are useful in different situations. Although we’re capable of using all five, most of us tend to have between one to three preferred negotiation styles that we use unconsciously in most challenging negotiations. Why? Either because our preferred styles have worked for us in the past, or because of our temperament (nature) or because of our upbringing (nurture). So if you’re involved in business negotiations, which negotiation styles are likely to reward you with the biggest profit prizes? This question will be answered later in this article. First lets visit each of these important conflict profile styles. Competitive styled negotiators pursue their own needs – yes, even when this means others suffer. They usually don’t want to cause others to suffer and lose, they are just so narrowly focused on their shorter term gains that they plunder obliviously through negotiations like a pirate. They often use whatever power and tactics they can muster, including their personality, position, economic threats, brand strength or size or market share. At its extreme negotiators call their behaviour aggressive or psychotic. When you need to act or get results quickly. Competition is critical when you are certain that something is not negotiable and immediate compliance is required. Competition can be an effective defence or counter balance to use against negotiators with a competitive conflict profile. We would recommend that you use a blended approach though, as both negotiation parties locking horns in a competitive battle can result in a spiraling deadlock. When you’re buying or selling something as a once off (e.g. selling your own home or car to a stranger), then your negotiation will likely be more competitive than say if you were selling to a close friend or family member, or if you were in a business to business negotiation. If you’re buying or selling a commodity product or service, and you have strong competition – look out, as you best get used to competing. The difficulty with people who are high compete (which a large percentage of buyers are) is that competitive styles overuse competition. This means that the other party knows exactly what behaviour to expect and can prepare more easily. In a negotiation of roughly equal power, high compete behaviour is very likely to lead to deadlock – which will get you nowhere. They may also be more interested in “winning” rather than reaching an agreement. If you’re recruiting a negotiator, a very low compete profile score would be something to be careful of. Some negotiators combine high compete with high avoid. 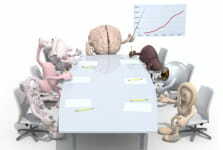 These negotiators will compete first, and if they don’t claim an easy scalp, they walk away from the negotiation table. Unchecked competition can leave business relationships in burning tatters. Those with accommodating profile styles tend to lose the most against competitive styles. So if a relationship is important to you, and if your market reputation is important, then be careful to curb your competition. When we feel victimised, we often plot our revenge. This often results in businesses living up to the letter, but not the spirit of a contract – claiming value wherever possible, and adding zero value. The most important thing to remember is: Don’t Cave In! Some people say that they make concessions in the face of a competitive negotiator demanding a concession – in order to create goodwill. Don’t listen to these self deluders, they’re bleeding profits. Appeasing competitive negotiators doesn’t create goodwill – it just creates requests for more concessions. What’s more, a competitive style negotiator will see you as weak, and come back for more. Restate your position firmly using strong language (not ‘we’d like’ or ‘want’, but rather: ‘we require’ or ‘need’) and never reward bullies. The opposite of competing. For accommodating style negotiators, the relationship is everything. Accommodating profiles think that the route to winning people over is to give them what they want. They don’t just give products and services, they are generous with information too. Accommodators are usually very well liked by their colleagues and opposite party negotiators. When you or your company are at fault, repairing the relationship is critical, and if you have nothing else that would benefit the other party. i.e. an olive branch or gift to rebuild bridges. If you are in a very weak position then sometimes your best option is to give in gracefully. Think about it: if they can crush you, and they know it, what is likely to be the outcome if you resist? Yes, bring your own bandages. It may be worth (humbly) reminding them that you will both stand to lose if they put you out of business, and ask if they really want to push you out of that market. If you both intend to work together in the longer term, then refocus the negotiations on the longer term, thereby reminding the other negotiation party that their taking advantage of you now may hurt them in the future. It is almost always a bad idea to accommodate when negotiating against high compete styles. With high compete negotiators your generosity will be seen as a sign of weakness to be taken advantage of. Giving away value early in the negotiation can leave you with a poor hand to play in the rest of the negotiation. With very little to offer, and relying upon the other party’s generosity, you’re gambling. Giving away value too easily too early can signal to your negotiation counterpart that you’ve very deep pockets, and your gift is just a taster of bigger and better gifts to come. To some negotiators, an accommodating style appears to promote harmonious relationships. What these accommodating profiles miss is the myriad of other options that create strong enduring relationships. Giving away the farm usually just creates one happy negotiator, and that’s not you. Warning: some of the faulty thinking that puts accommodaters into negotiation damage control is thinking that because the goal is unimportant to you, it must have little value to the other party. Remember to do your homework by asking the value of your concession to the other party before making your trade or concession. When someone is offering you a gift at the negotiation table, do you humbly accept their generosity? Be careful, as theirs may be a proverbial ‘Greek Gift’ – i.e. they may be luring you into reciprocation, obliging you to give back something of greater value in return. So keep in mind the value of the item being given – the relative value to both sides. Make sure you don’t give back something of disproportionately higher value in return. You also need to be careful that they are not an incompetent negotiator, making big concessions that jeopardises the viability of their business, or agreeing a deal that their managers will later veto. If they go bust because they are giving away too much, you could both end up losing. This is most often referred to as “passive aggressive”. People who habitually use this style really dislike conflict. Rather than talk directly with you about the issue, avoiders may instead try to take revenge without you knowing about it. The avoid style can be a typical reaction to high compete negotiators. Sellers will frequently call less often on high compete buyers (i.e. avoiding Competitive buyers) – and may choose to invest marketing money and share their best ideas and prized promotions with buyers who make themselves available (those who are not Avoiding the sales person). When the value of investing time to resolve the conflict outweighs the benefit; or if the issue under negotiation is trivial (trivial to both parties). Sometimes there is just not enough at stake to risk a difficult conflict situation. If there is a lot of emotion in a negotiation, it’s pointless pushing through and hammering it out. Better to allow people to calm down first, let the testosterone hormone leave everyone’s system first so that reason and rationality can reappear. At that point an avoid style is likely the most pragmatic alternative – suggest a timeout of 15-20 minutes. What to do when you’re dragged into a negotiation unprepared? Under these circumstances, avoidance is probably the most sensible strategy. Either avoid the meeting, or avoid discussing the issues upon which you need to prepare. Whoever has the greater urgency will usually end up with the short end of the avoidance stick. Stalling is a common sales tactics, when sales / the vendor knows that procurement needs their product or service yesterday. Conversely a buyer may hold out until the last day of the a quarter or month, knowing that the sales person needs to meet his or her target. So be careful about what information you reveal about the urgency of your need. When communication channels are cut off, you leave the other party to fill in the blanks. They may believe you need more time, or may think that you’re no longer interested in a business relationship with them, resulting in their approaching your competition, or contemplating downsizing. Mutual resentment is likely to build up – leading to frosty impersonal relationships. Paradoxically, avoid profile negotiators are frequently seeking to avoid conflict – and their avoid style instead lands them in more conflict. When differences are eventually aired, emotions and negotiation positions are often more difficult and fixed than they need be. Set clear expectations of timing early on in your negotiations. Best to be detailed in defining milestones with dates attached to each. If the other party is applying an avoid style, consider escalating the issue on one or both sides. Understand their decision making process and levels of responsibility. Having these insights can assist you in invalidating their reasons for avoiding, and will make your sharp questions more difficult to side-step. Escalation options will also be clearer to you. Too many people confuse the word ‘Compromise’ with ‘negotiation’. In reality compromising is usually little more than haggling and splitting the difference, with no deep understanding or value creation having taken place. Compromising often involves one or both negotiators settling for less than they want or need, usually resulting in an end position of roughly half way between both party’s opening positions. In the absence of a good rationale or properly exchanged trades, half way between the two positions seems “fair”. What compromising ignores however, is that the people that take the most extreme positions tend to get more of what is on offer, and the path they’re treading with blinkers on doesn’t allow the pie to be expanded. When you are pushed for time and you are dealing with someone who you trust. They also need to be clear that it would not be in their best interest for them to “win” a cheap victory. Both parties win and lose – but make sure you win the right things and lose the right things. Meeting half way reduces strain on the relationship, but usually leaves precious gold on the table (and with the central banking cartel’s gold suppression scheme losing its grip right now, every ounce of gold counts). When you have nothing left to offer, and this is the only way to seal the deal. i.e. a lousy situation. When you use compromising as an excuse for not preparing properly. Without quality negotiation training, most negotiators wing it, and end up compromising. 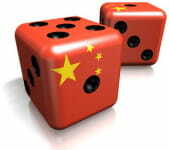 If the outcome of the negotiation is critical, then you should not compromise on things that you absolutely must have. One of the problems with compromising is: if you make concessions within your position with no strong rationale, the other party may assume that you are going to continue to make more concessions, and appeal to you using weak rationale. Whichever negotiator starts with the more ambitious opening position wins the compromise. So calculate early on who stands to gain if it comes down to compromises. If you get known for being a compromise styled negotiator, look out! Your trading partners will wise up to your negotiation style and they will start to make more and more extreme opening positions. Bigger opening positions result in greater chances of deadlocks. Compromises cheat both sides out of innovative solutions. Learn from collaborative styles by making it safe to explore options together. Invite the other party to join you in ‘what if’ frames to explore possibilities, without the danger of being tied to your idea. Only retreat within your position when you have a solid rationale for doing so, and when you’re being rewarded in another way. i.e. make a reasoned exchange. Trade across goals and interest. All too often negotiators try resolve 1 single goal at time, before moving on to the next tabled agenda item. Stay with the problem or opportunity for longer. Don’t give in so easily to the temptation of splitting differences until you’ve explored other alternatives. If the other party starts with an extreme opening position, be sure to quickly bring them back to reality, or counter balance with your own extreme position. Caution: extreme positions can lead to drawn out dog fights that result in more deadlocks. 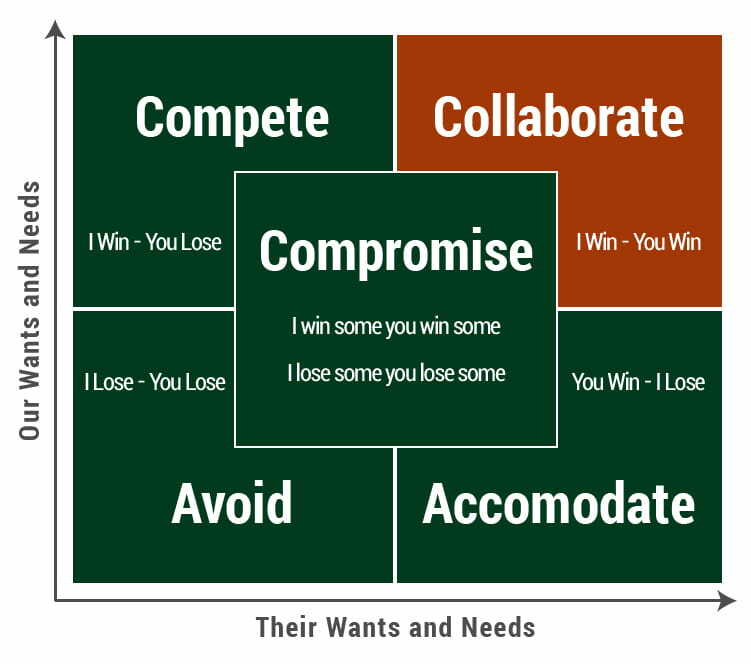 Most people confuse “Win/Win” or the collaboration style with the compromising style. This is most definitely not the case. “Win/Win” is about making sure both parties have their needs or goals met, while creating as much mutual value as time and resources allow. “Win/Win” negotiators usually evolve through the other profiles, growing into collaborative negotiators. This means collaborative profile negotiators can revert to one or two of the other styles when pushed or when the situation calls for it. Collaborative profile negotiators are adamant that their needs must be met – and they acknowledge that the other party has needs that must be met too. Tragically, too many account managers are overly accommodating and compromising. Resulting in competitive style buyers claiming more than their fair share. When these same competitive style buyers come up against skilled collaborative style negotiators, the competitive styles blunt coercion methods don’t get rewarded with concessions. Too many buyers are stretched and under tremendous time pressure, so temptation to compromise rather than invest time in collaborating wins out. Under most circumstances collaboration is the primary style you should use for most goals in business to business negotiations. As mentioned briefly in the Compete section: if a relationship is important to you, and if your market reputation is important, if the other party needs to perform and not just exchange a standard product for cash, high risk (e.g. new market or new product or both), if there is a large amount of money at stake, then you are best advised to think about all the ways in which you can build a more trusting collaborative working relationship. If you need to understand the feelings and deeper interests or motivations of all negotiators, then collaboration is your best path. Be careful not to collaborate with competitive style negotiators – unless they agree to and live up to your agreed (written or unwritten) rules of collaboration. Die hard competitive negotiators can be treated in transactional trading manner – e.g. “I’ll only give you this if you give me that”. When we share information we need to make sure that we share information at the same level of detail. Too much and we could be exploited – too little and the other party can lock up like a clam. Collaboration requires more time and needs to be at the right level. So if you’re a vendor and your buyer doesn’t have the authority or knowledge or won’t invest the time, save your effort. Best to talk with them about your style of negotiation or build a relationship at another level of their organization. Same advice goes for buyers in reverse. So when might you need to defend yourself against a Collaborative negotiator? If you have decided that it’s not in your interest to use a collaborative style with a negotiator, then decide on your alternative style and flesh out what behaviour translates into. So a commodity supplier who suffers a great deal of competition in their market place will try to get their foot in your door. A wise procurement manager will be careful to not investing too much time, or give any time – unless there is value. Your time is short, so be careful who you collaborate with. What is my preferred style of negotiation? The generalist TKI profile is a reasonable conflict profile. Once you know your style, you’ve taken the first step to gaining flexibility in your negotiations. There is much you can do as a member of a negotiation team, if you know your fellow team members’ profiles. Which of these 5 styles best describes your business client or vendor negotiation relationship? You may find it useful to allocate a percentage score to each style, and then ask yourself whether you’re happy with the current styles balance. If not happy, then make a plan to migrate to your preferred styles. Don’t blindly apply 1 negotiation style to your negotiation. Work through your list of goals in your trading plan, and decide which issues are best to: collaborate, compete, compromise, avoid, accommodate. inally – there’s very seldom an escape from having to use a competitive style. At some point, you’re going to need to do some claiming or sharing out the value you’ve created. So think carefully about which point in the negotiation you need to switch to competing. So if the other party compete too early, be prepared to pause the negotiation and have words ready to revert to another style. its a good definition of the 5 negotiation styles. But it would be far more usefull if it were academic. This work is interesting and more practical oriented. it is going to be an important resource. Thanks for putting this together in one place. Hard to find such comprehensive coverage of the 5 styles together. Tips on when to use each and the pitfalls are especially appreciated. Challenge is to remember this all in the heat of the negotiation. Guess that&apos;s why you&apos;re happy to give this quality theory away – to sell training services to use it properly.